Last weekend, in keeping with the tradition that Ben and I had for seeing Disney films on their opening weekend, I saw A Wrinkle in Time. 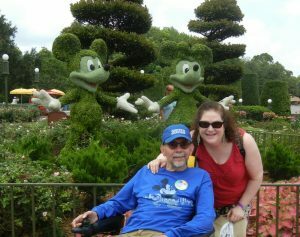 It is difficult for this Disney fanatic to admit that I was disappointed, but I was able to see beyond the film’s reliance on special effects to be touched by powerful messages that resonated with me. The film prompted me to go home and reread Madeleine L’Engle’s book on which the film is based, and together, the book and film have been a moving experience. In Disney’s film, A Wrinkle in Time siblings Meg and Charles Wallace are on a quest to find their father, who has disappeared as a result of a scientific experiment to cross time and space to find other planets. They are led on this quest by the guiding spirits of Mrs. Whatsit, Mrs. Who and Mrs. Which. It is a fanciful story, but one that touches on love, hope, faith, and stretching your mind to see possibilities. Not surprisingly, I saw many parallels to the role of caregivers. The spirits tell young Meg that they are in search of “warriors” who will “serve the good and light in the universe.” I could not help but think that this is a fitting description of caregivers. We are there to help our carees with their physical and emotional needs, to advocate for them, and to make life as positive as it can possibly be. My support of Ben encompassed all that would enhance his quality of life and support his wishes. That’s what a caregiver does. It took me a long time to understand why people called me brave when they described my experience with Ben. But, as caregivers, indeed, we are brave. Although ordinarily fairly shy, I was a fierce warrior when it came to advocating for Ben. I could not see it at the time, but now, I look back at that experience with pride and love. As fierce as I could be, and as joyful as my demeanor usually was, so that I could almost always make Ben laugh, Mrs. Which hit the nail on the head when she said, “The only thing faster than light is the darkness.” In A Wrinkle in Time, the “It” was the darkness, the negativity, the hate. For us, the “It” was ALS. As much as we wanted to be hopeful and I wanted to be a cheerleader, after any kind of scary incident, we would quickly fold under the darkness of ALS as it took away Ben’s ability to walk, to use his hands, to chew and swallow, to speak and to breathe. We had good, loving and silly moments, but each struggle and crisis cast the shadow of an inescapable darkness. We fought to keep those positive moments and attitudes, but it was a constant battle. Meg’s mom tells her, “My love is always there, even if you can’t see it.” Ben and I had to have that faith, and to be perfectly honest, it was not always easy. We lost patience with each other, hurt each other’s feelings, and went through phases of hopelessness and helplessness. We could see past our disconnects, impatience and frustrations because even when it was not apparent, the love we had for each other was always there without a doubt. Meg was able to reunite with her dad and bring her back to Earth. Of course, I could not “wrinkle time” and bring Ben back to this dimension. I’ve written so many times that Ben is with me in my heart. I know without question that although he has gone, his love is always here. Even though it does not always compensate for his physical presence, I feel him in so many ways. This film let me realize and embrace the unexpected gifts that Ben left with me. Through this experience, I gained a certain confidence, and I believe that Ben was happy to see that because he never lost confidence in me. Now, I have begun to acknowledge the quiet warrior within myself who, despite a bumpy road, is forging a new path, guided by the spirits of Ben, as well as of my mom, dad and grandma. The film A Wrinkle in Time did remind me of those beautiful and important messages that I hope will support, comfort and motivate other caregivers. However, my suggestion to you, which may be particularly helpful if you cannot get out to a movie theater, is to read the book while you wait for the film to become available on DVD/Blu-Ray/Digital.